Asbestos refers to a group of silicate minerals can be readily separated into thin, strong fibers that are flexible, heat resistant, and chemically inert, asbestos minerals are suitable for use in fireproof fabrics, yarn, cloth, paper, paint filler, gaskets, roofing composition, reinforcing agent in rubber and plastics, brake linings, tiles, electrical and heat insulation, cement, and chemical filters. Asbestos is no longer mined in the United States, but imports most of the asbestos it uses from Canada. Russia is the largest producer in the world. 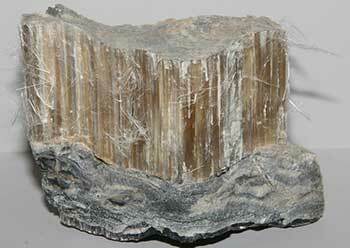 Chrysotile asbestos, the fibrous variety of the mineral serpentine, is by far the most important type of asbestos. It forms in metamorphic rock, that is, rock that has been altered by intense heat and pressure. Another asbestos mineral is called crocidolite. Crocidolite is a dark blue variety of the mineral riebeckite. Crocidolite occurs in metamorphic rock. Only about 4% of the asbestos consumed is crocidolite. Other, less important asbestos minerals in occasional use are amosite, anthophyllite asbestos, tremolite asbestos, and actinolite asbestos. Asbestos has a very high melting point. This, together with the flexible nature of the fibers, helps to determine its usefulness. Since the discovery in the mid-Twentieth Century that asbestos can cause a fatal lung condition, the mining and use of asbestos has decreased, and has become closely regulated in all countries. The name asbestos came from ancient times from a Greek word meaning unquenchable in reference to its resistance to fire and heat. For many centuries, small cloths woven from asbestos were a luxury item, for handling of hot items in kitchens and foundries. Most of the asbestos consumed annually is chrysotile asbestos. Asbestos is no longer mined in the United States. Imports from Canada account for most of the U.S. consumption. Russia, Canada, China, and Kazakhstan are major producers of asbestos, with lesser production from a dozen other countries. The tonnage of asbestos used worldwide is in a slow decline, as, for health reasons, many countries have restricted or altogether banned the use of asbestos. The decline is expected to continue. Asbestos is used to make heat resistant products. Long asbestos fibers are preferred, and short fibers are worth only a fraction of the price. The former uses of asbestos in building construction (fireproof ceiling panels in schools, for example) have largely disappeared, although asbestos is still used in making asbestos-cement products, automobile and truck brakes, roof castings, and applications where the fibers are encased in other materials and are unlikely to become free-floating. Roofing products containing asbestos (asphalt coatings) account for more than half of U.S. consumption. Friction products such as brake pads, and gaskets account for about another 20%. Asbestos is also used for some specialized concrete products. No better material has been found, or manufactured, that is as versatile as asbestos. However, due to the serious health issues involved in asbestos use, a number of substitute materials are utilized. A variety of different manufactured fibers have replaced asbestos in many applications. These include carbon fiber, cellulose fiber, ceramic fiber, glass fiber and steel fiber. Other minerals, such as wollastonite, are used for some applications.